By Scott Gilfoid: Kell Brook (37-2, 26 KOs) will be looking to earn a title shot against WBO junior middleweight champion Jaimie Munguia (29-0, 25 KOs) when he faces Brandon ‘Bad Boy’ Cook (20-1, 13 Os) in a World Boxing Organization 154lbs title eliminator on July 28 on Sky Box Office at the O2 Arena in London, England. Munguia isn’t experienced at 21, but he’s not a true junior middleweight. Munguia is a middleweight, who can still melt down to 154. 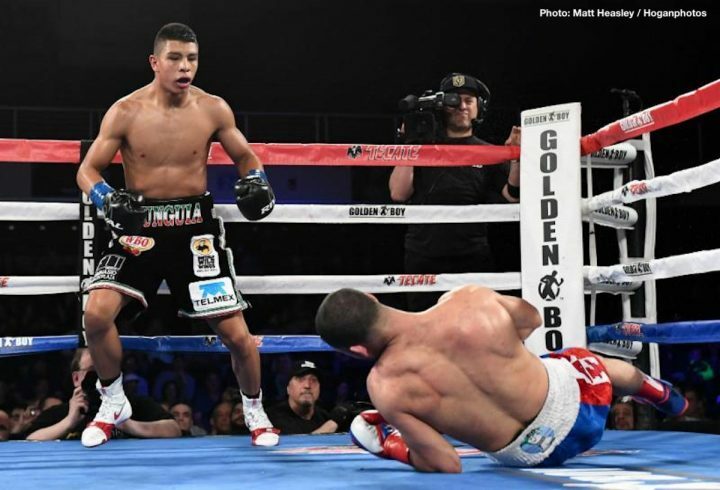 Young fighters like Munguia are able to melt down to fight in weight classes that are well below their natural size. Unfortunately, Brook can’t take hard shots without falling apart physically, and he shouldn’t be fighting at junior middleweight. Gennady Golovkin and Errol Spence Jr. both damaged Brook by hitting him with heavy enough shots to fracture his eye sockets. Brook really should go on a diet and go back down to 147, because that’s the only chance he has of continuing to have success in the sport unless he’s just looking for a cash out against Amir Khan. Brook’s promoter Eddie Hearn has him going in the wrong direction by targeting Munguia for a title eliminator, but he doesn’t have much choice. Brook is going to have to go after one of the champions sooner or later otherwise he’s going to look like a joke. I think it’s going to be a real problem when Brook gets inside the ring with Munguia, as he’s not a natural 154lb fighter like he’s been saying he is. Brook is little more than another welterweight like Sadam Ali, and we saw what Munguia did to him last month in scoring a 4th round knockout on May 12. Brook can’t afford to take the kinds of blasts that Munguia was nailing Sadam with. Those punches were thrown with incredible power. Munguia looked every bit as powerful as Gennady Golovkin, but taller and more aggressive. If Brook gets hit as often as Sadam was getting hit, the fight is not going to last. We’ll be talking retirement for Brook, because there’s nowhere he can go from there. When you start losing against 21-year-old fighters, it’s time to pack it in and walk away from the sport. That’s why it’s a real gamble for Brook to fight Munguia. Munguia, 21, has a mandatory defense coming up in July against former WBO champion Liam Smith (26-1-1, 14 KOs). Some boxing fans are giving the 29-year-old Smith a decent shot at beating Munguia, but I think it’s highly unlikely that he’ll be able to pull off the win. Munguia is too powerful and much too big for the 5’9 ½” Smith to handle him. Smith has recent wins over Liam Williams, who is a big puncher as well, but he had rotten stamina and wasn’t able to keep throwing punches after he faded in the early rounds. Munguia will keep nailing Smith with shots until Smith gets tired of getting hit and falls apart. Brook, 32, wants to become a mandatory challenger, and his best chance to win a world title is to go through 21-year-old WBO 154 lb champion Munguia. Brook still needs to beat Cook to earn that shot. If Cook has any kind of a chin, he could get Brook into the later rounds and cause him problems if he started connecting with his head shots. However, it’s still unlikely that Cook will have any success against Brook because he’s never shown the kind of talent that would suggest that he can beat a world class level contender.